A powerful wave of nostalgia comes rushing back with a single glance at the 2007 Ford Shelby Cobra GT500 show car. Strong visual cues had helped signal the serious performance potential of the great Shelbys of yesteryear. Now the 2007 Ford Shelby Cobra GT500's striking face and unmistakable Shelby signature announce this thoroughly modern Mustang means business. Melding the Shelby look with SVT's designed-to-drive philosophy creates an aggressive, classic look with enhanced performance capabilities. "There's a huge backdrop in Ford's Design Studio covered with photos of our favorite Mustangs – many of them 1960's-era Shelbys," says Doug Gaffka, design director, Ford SVT vehicles. "When it came to designing the GT500, there's no question the 1967-68 Shelby Mustangs inspired us. We tried to recreate the surface language of the '68 Shelby GT500, yet do so in a way that adds to the modern design of the 2005 Mustang – much like Carroll Shelby enhanced the design of the '67 Mustang." The 2005 Mustang design team also drew inspiration from classic 1968 Mustangs, the models that transformed the mild-mannered pony car into a muscle car with attitude. 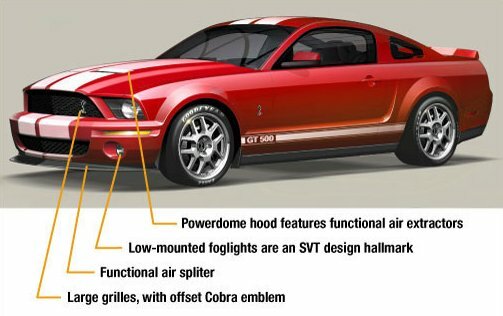 Envisioning an SVT model, the team tested 2007 Ford Shelby Cobra GT500 design cues on the Mustang GT coupe concept that was unveiled at the 2003 North American International Auto Show. In 2004, designers further developed the 2007 Ford Shelby Cobra GT500 look on the Mustang GT-R, a race-bred concept with the dual purpose of foreshadowing SVT's Mustang design direction and Ford Racing's plans to return Mustang to road racing. The 2007 Ford Shelby Cobra GT500 now comes into full light, punctuated by the classic LeMans-style white stripes that race along the top of the show car's "SVT Red" paint from nose to tail. The stripes recall the Shelby Mustangs that marked another important 1960's Mustang transition when Ford put it on the track to becoming a racing legend. The 2007 Ford Shelby Cobra GT500 nomenclature is prominent in the lower bodyside racing stripe, another cue from the classic Shelby Mustangs. The use of contrasting color overbody stripes in auto racing was introduced when the first factory teams employed them on identically equipped and painted cars to help identify the different drivers. Carroll Shelby adopted the stripes on his successful Cobra roadsters, and they quickly became part of his performance signature. Shelby striped all of his high-performance Fords to follow: the Daytona Coupes, Ford GT40s, Shelby Mustang GT350s and GT500s. To this day, Shelby's twin stripes are also associated with Ford performance, evidenced by those on the 2006 Ford GT supercar. Taking a page from Carroll Shelby's work on the GT500s of the late 1960s, Ford's design team took aggressive forms and shapes already apparent on the Mustang and further honed them for the 2007 Ford Shelby Cobra GT500's taut and race-ready appearance. A new front fascia, functional air splitter, larger grilles, hood-mounted air extractors, unique rear fascia and an integrated decklid spoiler are all designs cues that are pure Shelby. Many Shelby Mustangs were raced – and raced hard. For the cars to consistently perform to their maximum potential, the engines needed to breathe as much cool air as possible. Shelby accomplished this on his cars by opening up the grille area and redesigning the lower valance pan to maximize airflow into the radiator. The 2007 Ford Shelby Cobra GT500 employs that same idea with its reconfigured front fascia and oversized upper and lower grilles. "The 2007 Ford Shelby Cobra GT500's wide grille openings are imposing like a drop-jawed Cobra ready to strike," says Gaffka. "If you saw that look coming in your rearview mirror, it would make you move out of the way quickly." The restyled fascia not only allows for larger grille openings for increased airflow but it gives a more angled, aggressive edge to the headlamp insets. "The more aggressive fascia is actually a race-car design borrowed from the Mustang GT-R concept," explains Mustang senior designer Keith Rogman. "It works well with the overall look of the GT500 because racing has such a strong connection with Shelby." Attention was paid to make the upper and lower grille openings above and below the front bumper as symmetrical as possible for a more unified look. The overall shape and form of both openings were designed in deference to the Shelby GT500 circa 1968 – and provide the show car with a face that is strikingly similar to its predecessor. Very modern air-management technology, however, is evident in the details of the 2007 Ford Shelby Cobra GT500. Forcing a large amount of cool air into an engine bay is only half the battle of performance cars. It is an equally difficult engineering task to get the hot air out without affecting form or function. To that end, the 2007 Ford Shelby Cobra GT500's aluminum hood incorporates functional twin air extractors to help pull heated air out of the engine compartment and promote air circulation around hard-working components. "The process we created while working on the body design of the Ford GT really helped us come up with the functional front air splitter and rear spoiler for the GT500," says Jay O'Connell, SVT chief vehicle engineer. "It was essential that they provide measurable downforce at high speeds without detracting from the classic design." The functional front splitter is neatly integrated into the front fascia and helps limit airflow under the car at high speed. 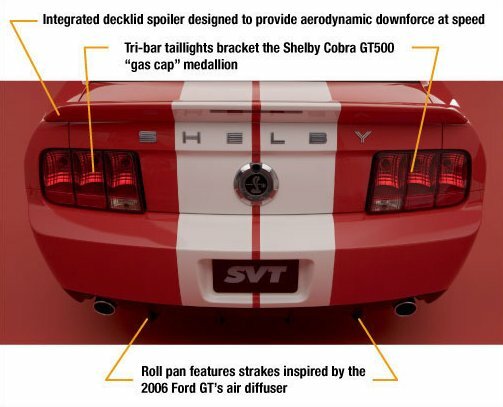 The science of air management also was applied to the rear of the 2007 Ford Shelby Cobra GT500 where Ford GT wind-tunnel lessons were used to help design the "high-back," rear-decklid spoiler. The Shelby Cobra GT500 houses distinctive foglights in the lower outside corners of the front fascia – long a signature styling cue of Ford SVT vehicles. While original Shelby GT500s had driving lights set into the grille, the inclusion of the SVT style foglights indicates just how well traditional Shelby and modern SVT design elements work together. Similarly, Gaffka's team decided to create a more modern rear fascia featuring diffuser-styled strakes and large cutouts for the dual chrome exhaust tips: "The rear fascia pays homage to the Ford GT supercar because the dramatic diffusers indicate serious high performance as part of the package. Rather than incorporate the full-across taillamps of vintage Shelby Mustangs, Gaffka's team kept the traditional tri-bar Mustang taillamps in another nod to blending modern cues with the classic look. 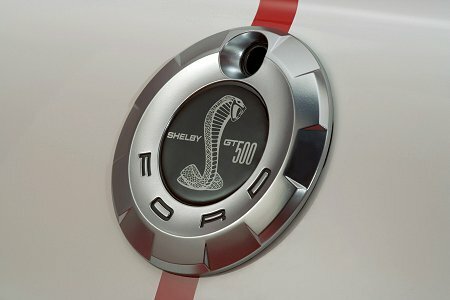 The taillamps are separated by a "gas cap" medallion that reads "Shelby GT500" centered on a Cobra image while bold "SHELBY" lettering stretches across the rear deck. 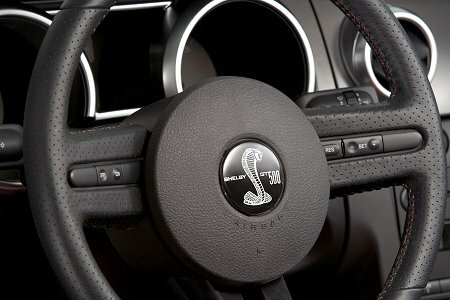 The Cobra snake logo featured on the rear medallion continues the tradition of both the vintage Shelby Mustangs and the modern SVT Mustang Cobras. It also commemorates the first time in thirty-five years a new Mustang has featured the Shelby name. Continuing the snake logo tradition of past-generation SVT Mustang Cobras, as well as late-model Shelby Mustangs, the fenders each feature an updated design of the Cobra. For the first time on any SVT Mustang, the front grille features an off-center snake in place of the standard running horse. "GT500" is emblazoned inside the side rocker stripes. The SVT logo can be seen on the center caps of the 19- x 9.5-inch aluminum wheels, a signature SVT location over the years, as well as on the doorsill plates. "We spent a lot of time updating the Cobra logo," says Gaffka. "The design team was very passionate about painstakingly adding detailed snake scales and adding a sharper edge to the teeth to honor the original. "The Cobra logo is the perfect icon for the GT500. It represents the history and performance of both Shelby and SVT. And, the Cobra badge shows the future of Mustang performance, melding Shelby and SVT into a thoroughly modern vehicle that still recognizes its legacy." Comfort and style have a clear mission in the Ford Shelby Cobra GT500 show car: provide a well-appointed yet businesslike cockpit that clearly appeals to the driving enthusiast. While seating position and comfort are always top priorities for drivers, quality materials and craftsmanship are no less important. Just a single look or touch needs to convey instantly that this is one very special Mustang. "Today's Mustang Cobra buyer expects the kind of amenities and a level of comfort and fit and finish that simply weren't available during the Shelby heydays," says Doug Gaffka, chief designer, Ford SVT. "But we also know of enthusiasts who believe that a woodgrain dash doesn't belong in a 1970 Shelby GT500 – or any purposeful performance car. So we sought to exceed the expectations of both in the new 2007 Ford Shelby Cobra GT500." The 2007 Ford Shelby Cobra GT500 interior design borrows from the 2005 Mustang's symmetrical instrument panel and square-arched "eyebrows" on each side of the center stack, paying tribute to the muscle car's 40-year heritage. The quality materials, precision craftsmanship and technical innovations translate perfectly to the higher-end SVT model. The GT500 also shares the base architecture's solid structure, forming the basis for engineering a quiet interior. As a result, enthusiasts will enjoy more of the 450-plus horsepower, all-American V-8's throaty grumble and less of the wind and road noises that distract from enjoyment of long drives. 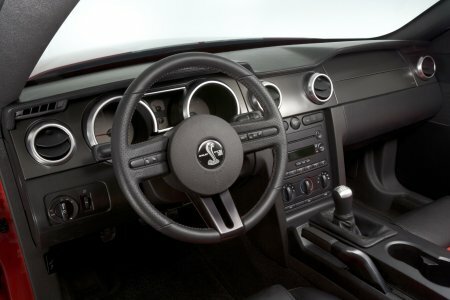 Time spent at race tracks to develop the 2005 Mustang pay off in the GT500's interior ergonomics. The steering wheel, shifter and pedals are all placed optimally for enthusiast driving, ideal for heel-and-toe performance shifting, thanks to the upfront engineering work. The seating position is more natural, supportive and comfortable for drivers – either for spirited track driving or for long stints along the twisties. "We spent a lot of time developing the 2005 Mustang at race tracks because we knew enthusiast driving traits would benefit all versions of the car, not just the 2007 Ford Shelby Cobra GT500," says Hau Thai-Tang, director, Advanced Product Creation and SVT. "These track tests were important for tuning the car and, importantly, for laying out key driving interfaces inside the car." The 2007 Ford Shelby Cobra GT500gives new meaning to the term "leather interior" as the dash, seat borders and door panels are completely wrapped in Black Ebony leather. Also wrapped in ebony leather are the shift lever, shift boot and parking-brake handle. For visual contrast, the 2007 Ford Shelby Cobra GT500 features satin-aluminum finished trim (rather than traditional chrome) and new "SVT Red" leather seat inserts and door-trim panels provide a marked contrast to the rest of the leather-trimmed cabin, creating a very special driving environment. Mini-perforated leather seat inserts cover the 2007 Ford Shelby Cobra GT500's extra-supportive bucket seats for a soft, supple hide that breathes, making for a more comfortable ride. As an added styling touch, Cobra emblems are embroidered on the front seatbacks. When the driver takes hold of the steering wheel, he or she will instantly know this is a car made for the serious car enthusiast in part due to the substantial size and feel that enhances driver control. "One change we made in the 2007 Ford Shelby Cobra GT500 interior plays directly into the driver's hands – literally," says Gaffka. "We redesigned the leather-wrapped steering wheel so the grips are thicker and better positioned for enthusiast driving. And, of course, the airbag cover had to wear proper GT500 identification." High-performance driving involves keeping track of a myriad of visual inputs, and that includes the regular monitoring of engine and other vehicle system functions. As such, the 2007 Ford Shelby Cobra GT500 has a unique instrument cluster specially designed for the needs of an enthusiast driver. To enthusiasts, a tachometer is at least as important as a speedometer, and a full array of gauges is a must. As such, the positions of the tachometer and speedometer are reversed on the 2007 Ford Shelby Cobra GT500, making the tachometer the dominant gauge visibly for the driver. Also, the voltmeter gauge is replaced with a boost gauge that monitors the performance and health of the supercharger. The reorganized gauge faces feature a unique titanium-colored finish, with white lettering – a unique performance cue SVT pioneered on the original Mustang Cobra. At night, the color of the illuminated letters can be modified by the MyColor™ color-configurable instrument panel. The system consists of three light-emitting diodes – green, blue and red – projected through "light pipe" fittings located on the sides of the speedometer and tachometer. At the driver's command, these pipes mix various combinations of the three primary colors to create more than 125 unique background color options for the gauges. The center stack is well designed and uncluttered for easy use of the radio, climate control and other switchgear with minimal driver distraction. The highlight of the driver's cockpit is the substantial leather-wrapped shifter for the six-speed manual transmission. Reviews of similarly equipped 2005 Mustang GTs promise enthusiasts will appreciate the shifter's short, smooth shifts just as much as its visual importance. The 2007 Ford Shelby Cobra GT500 shares the base architecture's larger dimensions that open more space inside the cabin while providing an aggressive stance and a foundation for great driving dynamics. The benefits include more room for the driver and front- and rear-seat passengers for more comfort on long trips. Importantly, the trunk is more than 10 percent larger to hold more travel gear. "The tallest drivers in our customer base have not been fully happy with previous Mustangs," says Jay O'Connell, SVT chief vehicle engineer. "We've addressed that in this all-new car, while maintaining the 'cockpit feel' essential to a driver's car. But we wanted to improve comfort for passengers, too. The extra cabin space makes a world of difference on long drives." Together, these changes help make the 2007 Ford Shelby Cobra GT500 a driver-oriented car that possesses style and comfort – and no woodgrain in sight.